Artificial intelligence is slowly making its way onto smartphones – and may be a staple feature on devices in 2018. Many smartphones released in the past year have included AI-focused hardware and software, from Google’s Pixel phones to Apple’s iPhones to Huawei’s Mate line. These phones use AI in all sorts of clever ways, from imaging and photography, to power efficiency, to security. Here’s a rundown of the current and coming AI-powered smartphones and the features that make them interesting. Artificial intelligence features on Apple’s iPhone X primarily focus on imaging and animation. The smartphone includes a dedicated “neural engine” chip, which processes certain functions on the iPhone X without taking power away from other, more standard processes on the device. Alongside its neural engine, Apple released the iPhone X with its Face ID facial recognition system. Its “TrueDepth” front-facing camera is able to create a 3D map of a person’s face and use that to identify the person, which is used to log into the device and authenticate apps and services like Apple Pay. This information is stored on neural engine chip for power efficiency and security. With this 3D facial-mapping information, Apple also created “Animoji,” or animated avatars, which mimic a person’s motions and voice as a fun demonstration of what AI can do. The neural engine similarly stores the animated images and allows Animoji to move in real time with minimal lag, to be as close as possible to a person’s true motions. The iPhone X also uses its updated, AI-focused hardware to improve graphics on its augmented-reality features, which are powered by Apple’s ARKit software. Samsung began to dabble in the AI space by introducing its own assistant software called Bixby. The feature is currently on the Galaxy S8 and Galaxy Note 8 smartphones. Rumours also suggest Samsung will introduce updates to Bixby on the upcoming Galaxy S9. Unlike Apple’s Siri assistant, which is basically a voice-activated search engine, Bixby includes functions that let users identify items through the camera app on a Samsung smartphone. With Bixby Vision, users can learn details about objects and locations, find out how to purchase items they see in the real world, and translate languages, among many other tasks. Users can launch the voice-assistant function, Bixby Voice, which can not only pull information but can also perform hands-free functions, such as opening an application or setting an alarm clock. Rumours also suggest the Galaxy S9 may include chips that introduce features to the device similar to Apple’s Face ID and Animoji. These features, however, are yet to be confirmed. AI features on the Pixel 2 and Pixel 2 XL are understated, but similarly focused on imaging. While several competing smartphones have introduced new hardware to complement the AI, like how several smartphones now use dual-camera setups to support Portrait Mode features, Google’s devices have the same function, but are powered strictly by software. Portrait Mode on the Pixel 2 and Pixel 2 XL have been hailed by many tech reviewers as one of the best iterations of the feature – and many have figured out how to port the software on to older Google smartphones, as well as to devices by other manufacturers. Google’s software also allows for smart organisation and sharing of photos. Google’s popular photos app for iOS and Android is powered by artificial intelligence, to help you find groups of photos with the same person, or find all of the photos you own that have “cats” in them, or “trees,” or any other object you can think of. Google’s own Google Assistant, which includes a number of voice-activated functions, is also used to power Google’s visual search engine called “Lens.” Similar to Bixby Vision, Google Lens uses the Pixel 2 and Pixel 2 XL cameras as identification tools. A highlighted feature is the software’s ability to identify phone numbers and web addresses and allow users to save the details on their handsets. Google’s AI features are interesting in that they are available, not only for the Pixel 2 and Pixel 2 XL but also for several Android-based devices, especially those running Android Oreo, and even iOS devices. While Amazon’s Alexa software is intended primarily for smart speakers and home assistants, the voice-assisted feature is also compatible with smartphones. Smartphone users can take advantage of Alexa, primarily for easy ordering from Amazon services. 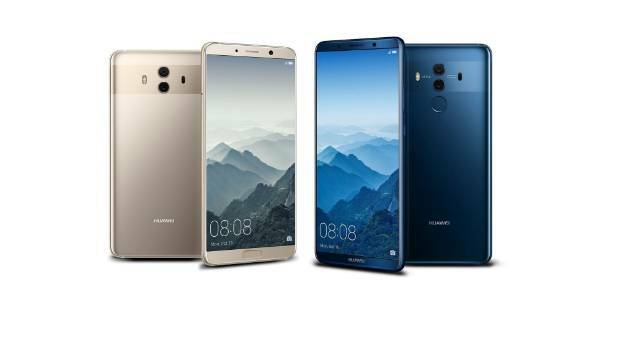 ​Huawei hails itself as the first mobile manufacturer to introduce a dedicated AI chip for smartphones. On devices such as the Huawei Mate 10 Pro and the Honour View 10, the neural network processing unit powers a number of imaging, power efficiency, and security features. Huawei’s devices, which include the Kirin 970 AI chip, have a function on their camera app that can identify an object in a photo and adjust the camera’s parameters to capture the ideal image. The camera can identify people, food, text, animals, or a portrait. The chip also holds sensitive information from Huawei’s Private Space feature, which allows users to have a separate account space on devices for work or other tasks that desire extra protection. LG hasn’t really delved into the artificial intelligence space, but current rumours suggest the smartphone maker may soon announce a new version of its LG V30 smartphone with new AI features included. The device will reportedly be called the LG V30 Alpha (LG V30+α) and may include AI features powered by Google software. The features may be similar those seen on the iPhone X and Samsung’s recent smartphones, but details about the device have not been confirmed.